Saskatchewan Premier Scott Moe and Alberta Premier Rachel Notley have formally asked Prime Minister Justin Trudeau to include discussion of the oil differential crisis at the upcoming First Ministers meeting this week. “Billions in lost revenue and thousands of jobs have been affected, and we need the federal government to treat this crisis with the seriousness that it deserves” Premier Moe said. 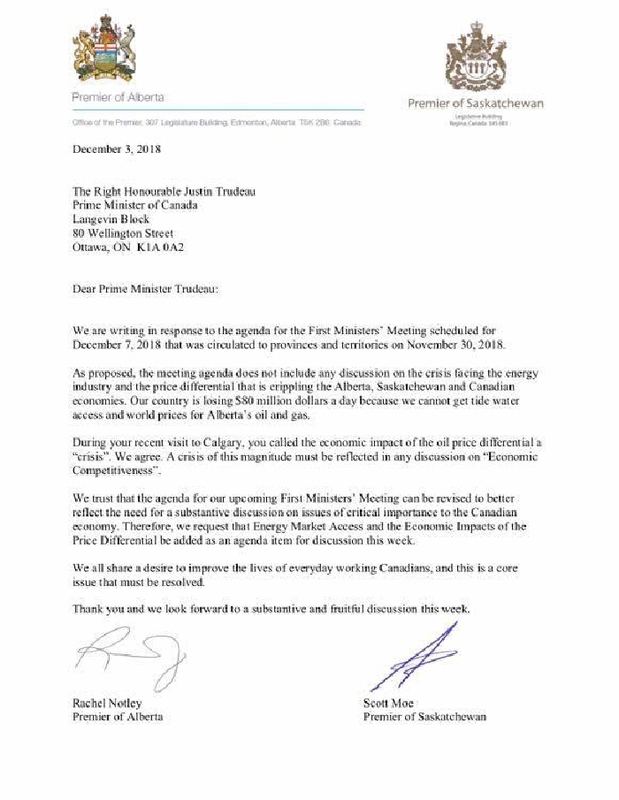 “As proposed, the meeting agenda does not include any discussion on the crisis facing the energy industry and the price differential that is crippling the Alberta, Saskatchewan and Canadian economies. Our country is losing $80 million a day because we cannot get tidewater access and world prices for Alberta’s oil and gas,” reads the letter. On Monday, the Saskatchewan government had announced it would not be following Alberta’s plan to cut oil production in an effort to reduce the price differential. About 25 producers are expected to face cuts until 35 million barrels of oil currently in storage are shipped out of Alberta. The price differential between Western Canadian Select and West Texas Intermediate has fluctuated in recent weeks, peaking at around US$36 (C$47) a barrel. The WTI price was close to US$53/barrel late Monday afternoon and Western Canadian Select was selling for US$17 per barrel. Unlike Alberta, 60 per cent of Saskatchewan oil isn’t subject to the price-differential questions, but the differential is expected to cost the province $96 million by the end of the fiscal year. But Saskatchewan’s overall outlook for oil prices remains positive. Even with the differential costs, Saskatchewan is still coming out ahead because oil prices remain high (resulting in an extra $105 million since budget projections) and a weaker Canadian dollar works in the government’s favour, adding an extra $11 million to provincial coffers. Oil and natural gas revenue projections continue to go up, and are now $18.1 million higher than where they were seven months ago.